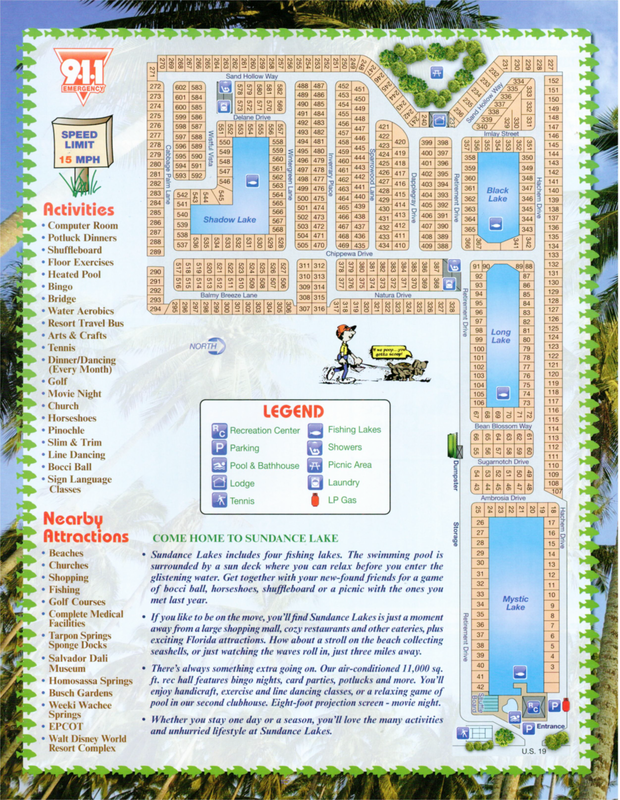 Whether you stay one day... or a season... you'll love the unhurried lifestyle and many activities at Sundance Lakes Adult RV Resort. There are four spring-fed lakes for fishing. The swimming pool is surrounded by a sun deck where you can relax before you dive into the glistening water. Get together with your new-found friends for a game of bocce ball, horseshoes, shuffleboard or a picnic with the friends you met last year. There are marinas, golf courses, medical facilities and world-famous tourist attractions close at hand. All sites are complete with water, sewer and electric service. Electric meters are read monthly and payable on or before the 1st of each month. Utility deposit of $50 refundable when leaving Sundance Lakes. Propane, cable TV and telephones available at prevailing rate. Rates based on 2 person occupancy. Extra person fees: per night $3.00; per month $35.00. Rental Park Models: Rent for $1,200.00 per month.